Mr. Masaya Maeda, Managing Director and Chief Executive of Image Communication Products Operations at Canon, Japan gave an interview at the CP+ Photo and Imaging show in Yokohama, Japan recently. Although Canon is not known to reveal anything useful to indicate their future product plans and upcoming introductions, I am reading between the lines and coming up with some possible conclusions. First and foremost, Canon may be experiencing some manufacturing and engineering difficulties in their operations. They are behind in their new product introductions so far but recently announced their 2013 net income is projected to increase by 13%, mostly due to the weakness of the Japanese Yen, not from increased sales and product shipments. I believe Canon is at a crossroad of some major decisions. They have discontinued the EOS-1Ds Mk III and EOS-1D Mk IV bodies. This has in effect eliminated their 'mega pixel' camera and APS-H sensor. To date, there is no word on any replacement. Instead, the 'mega-pixel' mantle seemed to have been passed to the EOS-5D Mk III for now. This is an excellent camera and my pick for the best value in full frame DSLR on the market today. Canon is working on a new mega-pixel camera rumored to have a 40+MP sensor but has not decided whether to make it an EOS-1 model or when to introduce it. The upcoming EOS-70D is most probably going to continue as an upgrade to the 60D, with more AF points, higher ISO performance and maybe built-in GPS and WiFi. The EOS-7D Mk II will most likely take a turn towards the semi-pro direction. Borrowing from the technologies of the EOS-1D X, the new camera may have a higher built quality, much improved ISO performance (its Achilles heel) and more robust AF points and possibly a new sensor. 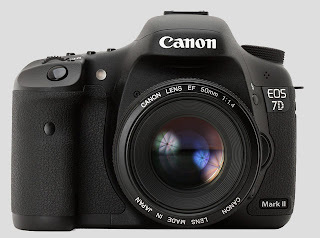 The EOS-7D is another very good camera and my pick for the best value in digital photography today but it is showing its age (over 3 years old) and when the replacement comes some time this year, I would have owned the camera for almost four years. It is clear Canon's strategy is to drive down the cost of ownership for full frame photography. When the EOS-1Ds Mk III first came out, I paid $8,000 for it and now the EOS-5D Mk III can easily beat the 1Ds Mk III's performance for a fraction of the price. The EOS-6D is a good full frame camera selling for about $1,900 but its performance is not comparable to the EOS-5D Mk III in my opinion. This is a dangerous strategy to follow because if Canon does not protect the investment of its most prized customers, their loyalty cannot be guaranteed. Canon has taken the opposite direction when it comes to the Series II Super Telephoto lenses introduced last year. Their prices have gone up dramatically compared to the Series I lenses but the performance improvement is only incremental. You can read my reviews on all the cameras and lenses mentioned above by visiting my Equipment page on my website.